Parmigiano-Reggiano, called Parmesan in the English language, is a hard granular cheese, cooked but not pressed, named after the producing areas of Parma, Reggio Emilia, Modena, and Bologna (all in Emilia-Romagna), and Mantova (in Lombardia), Italy. Parmigiano is the Italian adjective for Parma. Parmesan is the French-language name for it and also serves as the loose term for the cheese in the English language. The name Parmesan is used for cheeses imitating Parmigiano-Reggiano, with phrases such as Italian hard cheese adopted to skirt legal constraints. Parmigiano-Reggiano is made from raw cow's milk. Traditionally, cows have to be fed only on grass or hay, producing grass fed milk. Only natural whey culture is allowed as a starter, together with calf rennet. The only additive allowed is salt, which the cheese absorbs while being submerged for 20 days in brine tanks saturated to near total salinity with Mediterranean sea salt. The product is aged an average of two years. The cheese is produced daily, and it can show a natural variability. True Parmigiano-Reggiano cheese has a sharp, complex fruity/nutty taste with a strong umami flavour and a slightly gritty texture. Inferior versions can impart a bitter taste. 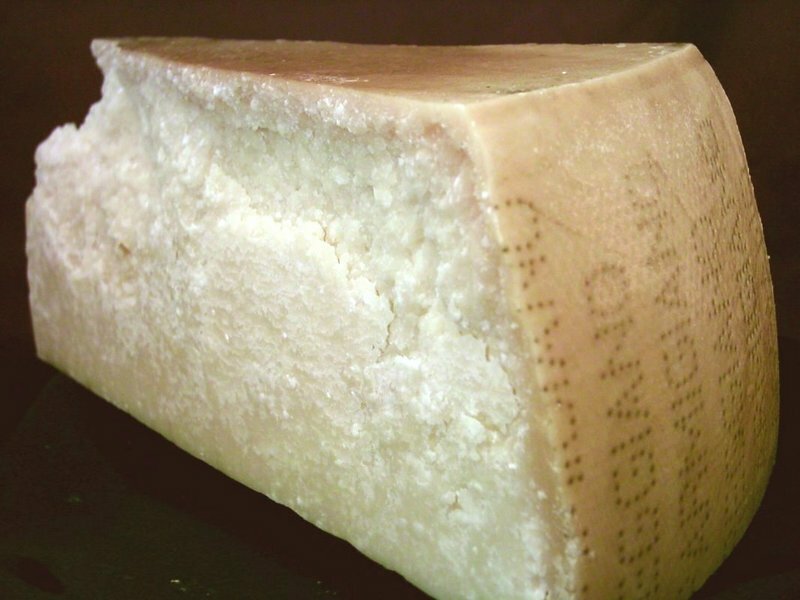 Gourmets consider Parmigiano-Reggiano a splendid "table cheese" for eating not merely for grating. In Emilia-Romagna it is often paired with pears and walnuts and enjoyed at the end of a meal. Many consider it to be at its best at 24 to 30 months, when it is still soft and crumby, with tiny crunchy spots from the crystallised salt, yet rich and complex in flavor. Uses of the cheese include being grated with a grater over pasta, stirred into soup and risotto, and eaten in chunks with balsamic vinegar. It is also a key ingredient in alfredo sauce and pesto.